The Smarttress is unique in a sense that it can offer you peace of mind in a rather unprecedented manner, as it comes embedded with a whole lot of sensors that have their purpose. This collection of sensors will be able to to detect any kind of suspicious movement that is made on the bed, where a notification will be sent to your handset if you have already set it to do so prior. 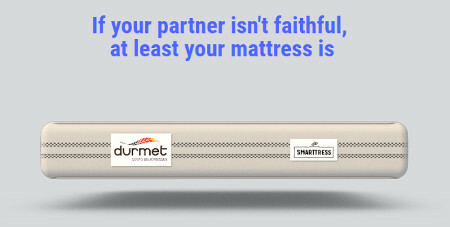 The idea of the Smattress came about after the company looked through research on the high rates of infidelity in Spain, and Spain happens to be one of the countries in the world tha thas the highest reported “affair rate” of 2.4 per year for men and 1.3 per year for women. The sensors in the bed will be able to detect movement, although the mattress is also discreet and smart enough to be able to tell the difference between something innocent such as a child jumping up on the bed, compared to an extramarital tryst. In fact, you will be able to get an idea of the bedside metrics in terms of thrusts per minute and the ilk. It does raise some rather interesting questions, of course, if you purchase a mattress like this, surely there are other ways to resolve any kind of conflict or affairs, and for those who have the mattress already, is it really something that you would like to know, that is, to be buzzed whenever there is some sort of unwanted activity that is going on? This standard double-bed size Smarttress will begin at a price point of £1,200. Is this post an April Fool’s Joke a few weeks late?